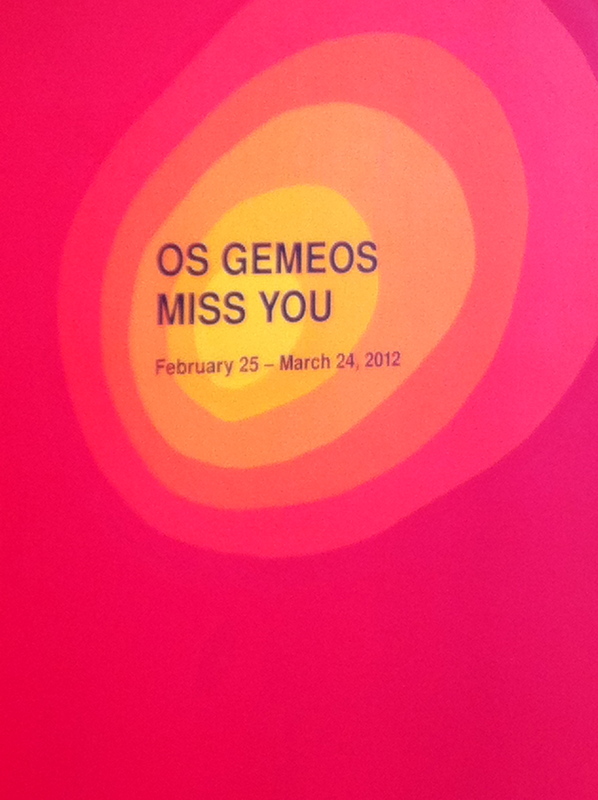 Number 1 on my must see list of shows for 2012 2as Os Gemeos’ “Miss You” at Prism Gallery. Saturday was its last day and I finally made it in to see their work. 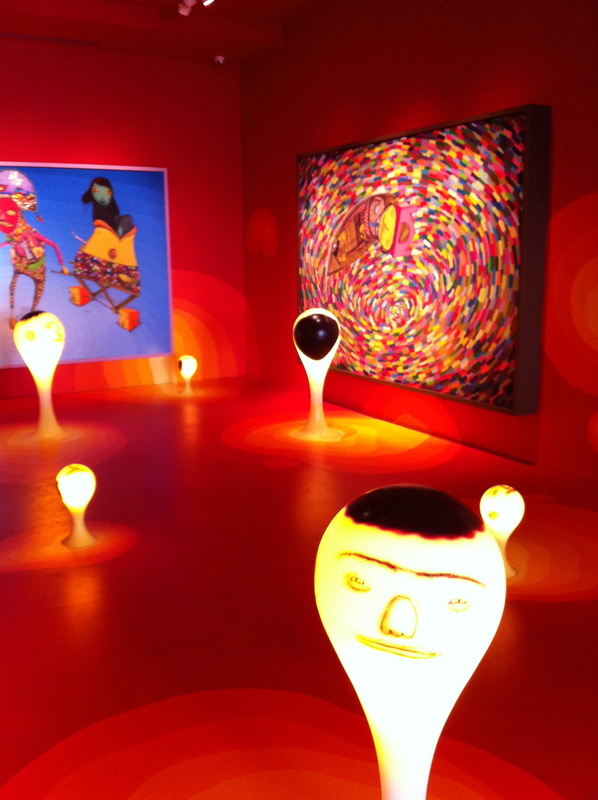 I loved how the gallery was transformed into the mythical world found in their paintings. 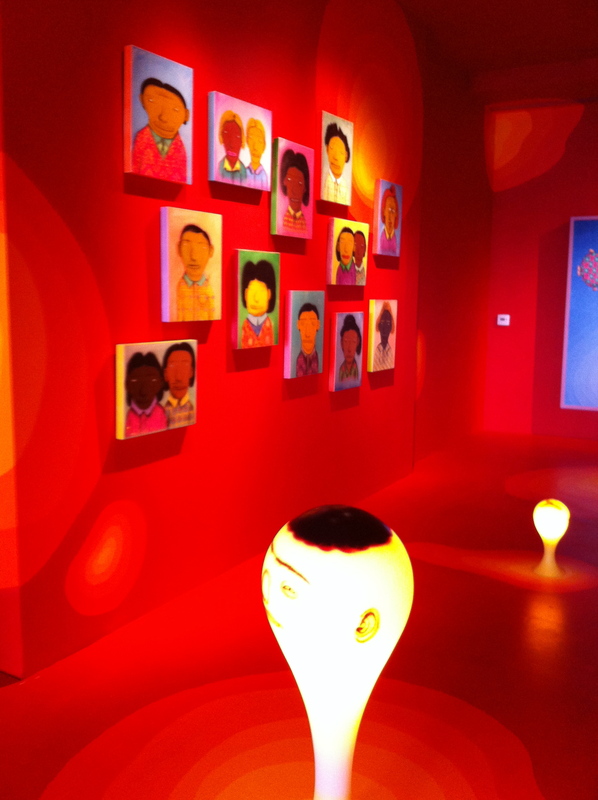 The walls and floor were painted in gradient shades of crimson and orange to look like fresh lava. Emerging from the lava floor were these glowing primordial globes painted to look like heads struggling to ascend to the ceiling. 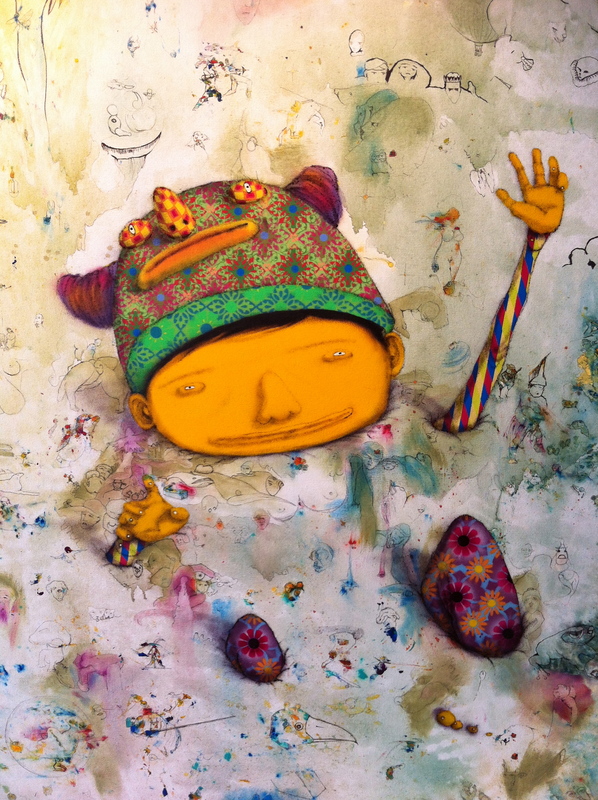 Os Gemeos is Otavio and Gustavo Pandolfo, twin brothers hailing from Brazil whose roots are in graffiti art and murals. While their style has a distinct look in caricature and theme, their neo-surrealist paintings belie a complex tapestry of themes all punctuated by the vibrancy and color of their homeland. 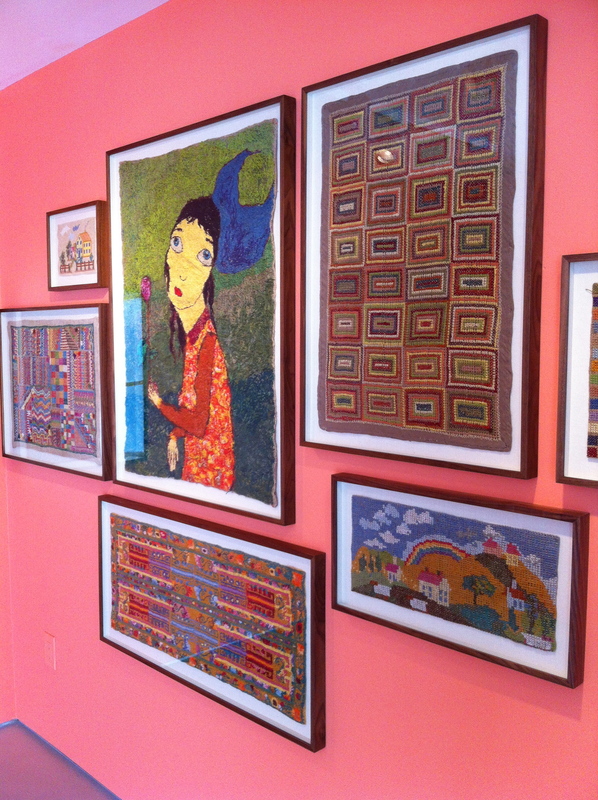 The family portrait wall suggests the richness in ethnicities and cultures resident in Brazil, and the familiar comforting embroidered works found upstairs carry that familial theme. 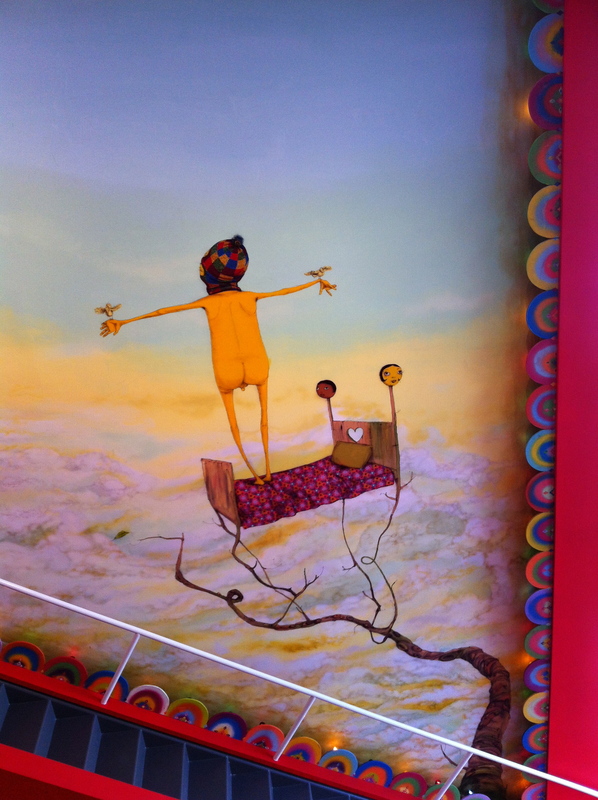 What I love most about Os Gemeos is that each piece masterfully straddles the lines between the conscious and the subconscious, dreams and reality. While on the surface a piece may appear whimsical, it simultaneously evokes a sense of gravitas. This untitled piece, which was a collaboration between the twins and their older brother was one of my favorites of the show. On the surface, this playful child shouldn’t have a care in the world, but upon closer inspection the child appears to be overcome by a barrage of subtle, dreamlike images floating on the canvas. Is it the subconscious coming to surface? 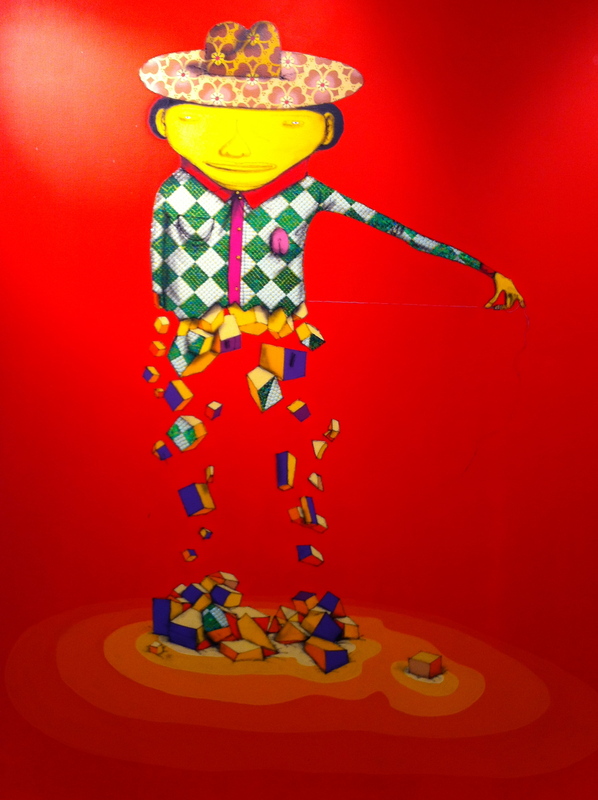 I found this both charming and somewhat haunting at the same time-another representation of the duality of Os Gemeos (I’m pretty sure that trait can be found in Geminis too). I also liked the multi-dimensional aspects of their work where subjects appear to be piercing through dimensions in search of something. At times the pieces appear to be deeply personal. There was a beautiful mural painted on the wall near the stairs of the gallery. Looking out on it from the second floor, it reminded me of Rio de Janeiro’s iconic art deco statue of Christ the Redeemer sitting at the peak of Corcovado hill. This piece is called O Artista (The Artist) which hints at the fragility if they can become undone through the mere pulling of a single thread holding everything together. 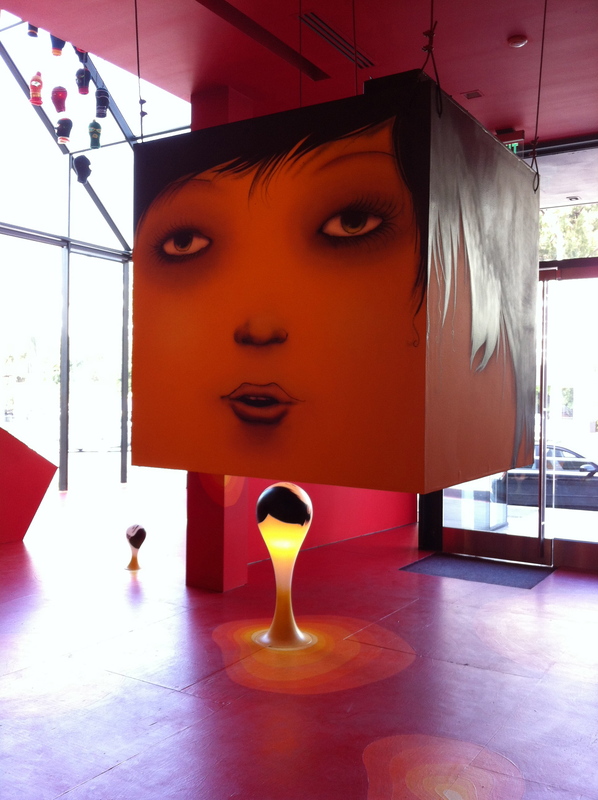 When I first walked into the gallery the first thing I noticed was the large 3D cube of a woman’s head suspended by cable from the ceiling; as I was about to leave I noticed a person standing inside it. When they emerged from the bottom of the cube they said I had to see what was in there. Curiosity got the best of me and I took a peek. 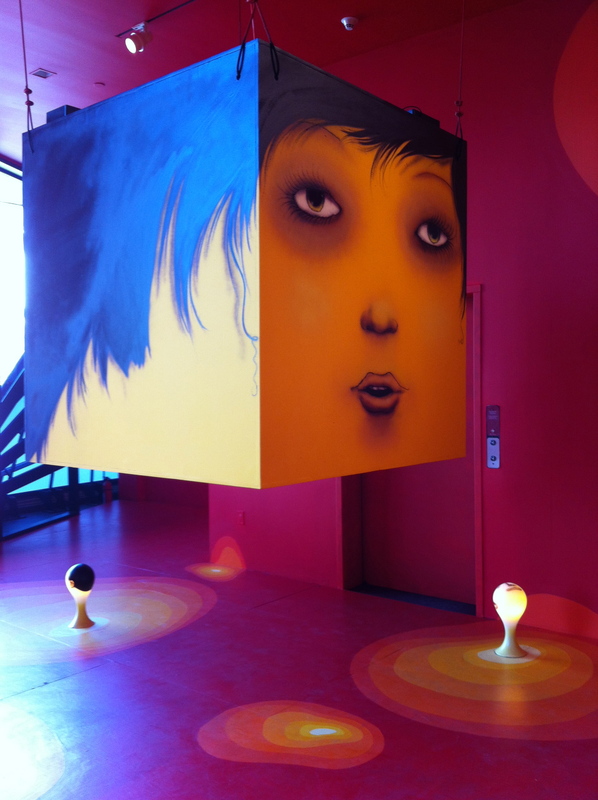 True to form with Os Gemeos, there is something beneath the woman on the cube. I certainly wasn’t expecting this. 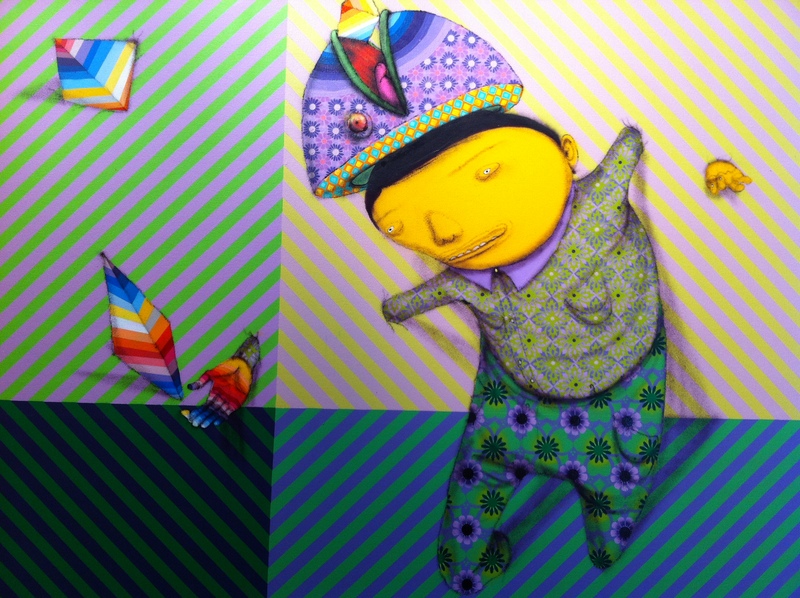 Os Gemeos @ Prism LA from CultureShockArt on Vimeo. About the video…I really didn’t intend to post it b/c if you couldn’t tell I have NO iMovie skills whatsoever but I just had to show a snippet of what was going on in that cube! If I hadn’t been here on the last day I wouldn’t have posted it and spoil it for others, but since their run at Prism is over, I figured why not share! This was a fantastic show and a great opportunity to see a more comprehensive portfolio of their work. Next Next post: Play It Again Jerram: “Play Me I’m Yours” Hits L.A.